Acupuncture is a part of Traditional Chinese Medicine ("TCM"), and has been used to treat ailments of people and animals for over 2,500 years. 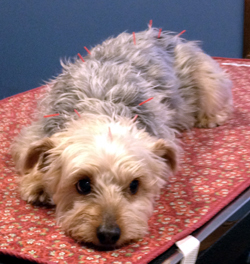 The use of acupuncture in veterinary medicine was not recorded outside of Asia until the 1950's and 1960's. At that time, veterinarians in Austria, Germany, and France began doing research and using acupuncture to treat their patients. 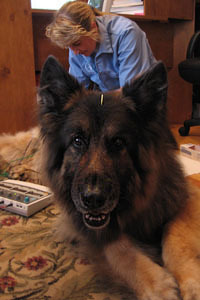 In 1974, the International Veterinary Acupuncture Society (IVAS) was organized in the United States, and has administered a course in basic veterinary acupuncture each year since its founding. Similar courses are now taught to graduate veterinarians at Colorado State University, Tufts University, and the Chi Institute for Traditional Chinese Medicine. At this time, IVAS has certified veterinarians in 17 countries, with a total membership of about 1,600 worldwide. Acupuncture is the stimulation of acupuncture points (acupoints) with a very fine metal needle. These specific points range in size from 1mm to 25mm and differ from surrounding tissue in their electrical conductivity. Acupuncture points have an increased electrical conductivity (decreased resistance), and when examined under an electron microscope, these points have been found to have a relatively high number of nerve endings and immune system cells. The acupuncture points communicate with the internal organs, muscles, bones, and sense organs via meridians. Meridians are the pathways through the body that connect the acupoints on the surface of the body with all underlying organs and tissues. Therefore, the acupuncture points can disclose diagnostic information about the organs they are linked to, plus are the avenue through which treatment occurs. 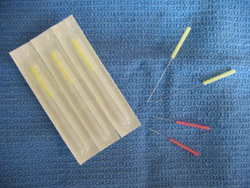 Depending on the patient's condition, some acupuncture treatments may involve mild electrical stimulation of the points (electroacupuncture), warming the needles with a stick of smoldering herbs (moxibustion), or injecting liquid such as saline, vitamins, or homoeopathic substances into the acupoints (aquapuncture). Acupuncture's effects have been explained in many different ways. The western scientific community has proposed mechanisms of action based on the neurophysiologic and endocrine (hormonal) effects of acupuncture. Based on these theories, scientists describe changes in blood flow, nerve impulses, neurotransmitter activity, and hormone levels in the body that result from stimulation of acupoints. The Traditional Chinese Medical perspective is quite different in its theories and explanations. One reason for the differences is that TCM theories were developed over 2,000 years ago when knowledge of anatomy and physiology was very different than it is now. Without a modern day understanding of the intricate functions of the nervous system and chemical processes in the body, the ancient Chinese doctors used different words to describe the functions and disease states of the body. Disease conditions were often described in terms of natural occurring states, such as "dampness", "wind", "heat", and "dryness". How does it work? One of the fundamental concepts of TCM is that the Qi pronounced "chi"). Qi is the energy that activates and maintains the life processes. There are many different types of Qi, depending on where it is located in the body and what it is doing. Meridians are the pathways by which Qi circulates through the body. TCM theory explains that when the body's flow of Qi is disrupted, or when there is an imbalance between the animal and its environment, there is disease. Stimulating acupoints changes the flow of Qi through that meridian. Therefore, according to TCM theory, the healing effects of acupuncture are seen as a result of restoring Qi flow through the meridians and therefore restoring balance and a state of health to the body.